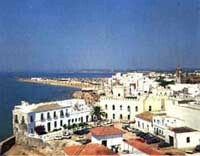 This municipality in the province of Cadiz situated on the Atlantic coast sits between Rota and Sanlucar de Barrameda, only about 60 km away from the capital city. 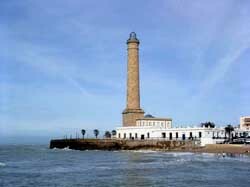 In Chipiona one can highlight its beaches and its touristic infrastructure, being the tourism one of the main tourist engines of the municipality. The history of Chipiona dates back to the roman presence in the south of the peninsula although great part of the original population were possibly tartessians as they lived in lands near this municipality, around the 2nd century before our era it appeared under the name of Caeponis Turri, this name surely came from the presence of a tower that was used as a lighthouse. It’s quite likely that they did fish salting and garum, very popular amongst the population specially in Rome. The fall of the empire and the arrival of the Visigoths lessened the population up to the point where it took several centuries to recover. The Arabs in al-Andalus built a mosque surely under the current church and a castle, a presence that left behind little evidence of its stay and that lasted until 1251, the year of the conquest of Chipiona under the leadership of Fernando the 3rd, and then re-conquered by his son in 1264. It wasn’t repopulated until 1297, year in which families from other places nearby came. Since the roman period there is evidence of shipwrecks caused by the reef situated in the entrance of the river Guadalquivir known as ‘Piedra Salmedina’. There was already a lighthouse built by the romans, and the current lighthouse is the biggest in Spain, the third in Europe and the forth biggest in the world with a height of up to 69 metres, built in 1867. It can be visited during the summer in small groups of five people on Tuesdays and Thursdays. This port, built in the late 20th century, is situated next to the mouth of the river Guadalquivir. Built upon an old fortress in the 16th century. Built upon another Arab castle in 1295. It has gone through several reforms over the centuries. Another of the main tourist attractions in Chipiona is its fish; The fishing activity has been important since the antiquity and the fish that we can eat today in the municipality is well-known for its quality. 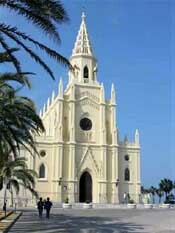 - Carnivals: A pagan celebration that was regulated in 1896 by the Chipiona town hall. It was forbidden during Franco’s dictatorship throughout the whole of Spain although shortly after the dictator’s death they were recovered. - Semana Santa (Holy Week): A Christian celebration during which there is a procession carrying several religious figures around the town. -The Pinar Pilgrimage: This pilgrimage is celebrated on the first Sunday of June in Pinar de la Villa. - Virgin Carmen: During this celebration they carry a religious figure out to sea and then in a procession through the streets until it ends with fireworks. - Soiree of Regla: During this festivity one can enjoy music, food and equestrian exhibitions. This National Park is situated very near Chipiona, so if you have time or you are planning to stay in Chipiona for a few days, we recommend a visit. The shortest route to get to Chipiona from Malaga is crossing through the Natural Park of Los Alcornocales from Algeciras, passing by Alcala de los Gazules, Medina-Sidonia, Jerez de la Frontera and turning off towards Chipiona before reaching Sanlucar de Barrameda. If you need a rental car in Malaga to get to Chipiona, feel free to check out our prices and book with plenty of time ahead.